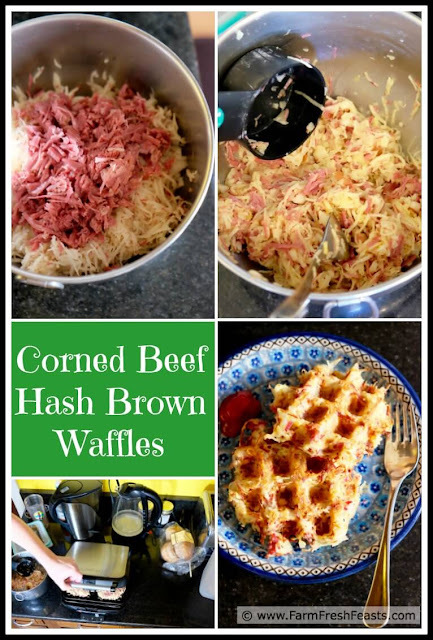 Leftover corned beef waffled with shredded potatoes for a savory treat for a post-St Patrick's day breakfast or brunch. I suppose at this point very little I do in the kitchen surprises my spouse, but this one sure did. 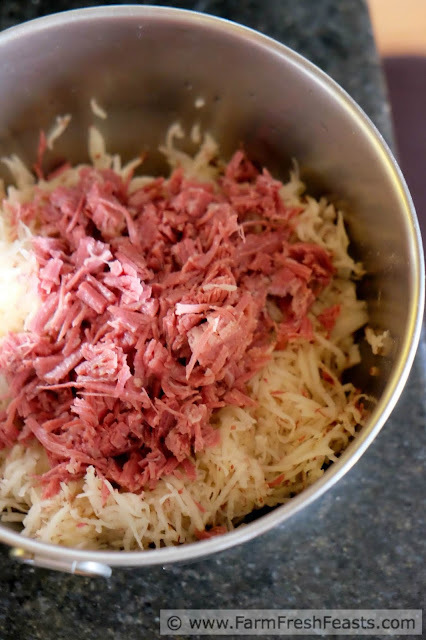 See, I had leftover corned beef. My daughter loves hash for breakfast. I wanted to find a way to actually get good hash browns--crispy brown on the outside and cooked all the way though. This recipe is a fun combination of all of the above. I see stylized photos on websites, and I make the assumption that behind the camera, and surrounding the beautifully garnished plate of food, are equally stylized spaces and people. 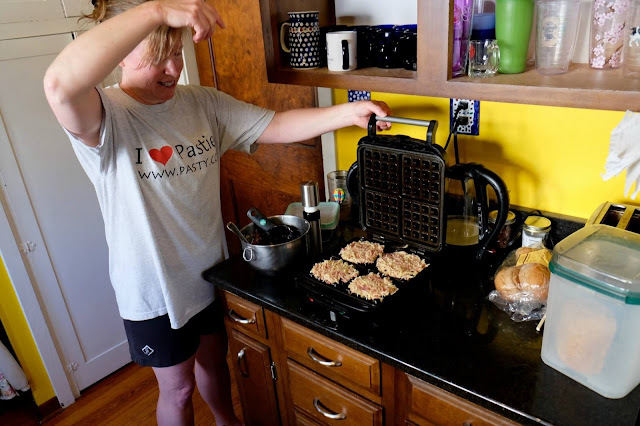 I'm here to blow up any ideas that I'm a stylized person by sharing, because my spouse took them, photos of me making these waffles. It's a weekend morning, I'm in comfy grubby clothes, and I'm just hanging out with the family and the dogs, enjoying a sunny morning. We probably went off on an adventure after we ate, I don't recall. I just know that it was relaxed, casual, and fun. Our dogs are underfoot because they are part of the family and that's how we roll. I used some locally grown farm share potatoes for this, finely shredded in my food processor. I suspect a thawed bag of shredded potatoes would work fine as well. Just be sure to squeeze all of the water out of the potatoes--that's key. For more recipes using potatoes, local or otherwise, please see my Potato Recipes Collection. This collection is part of the Visual Recipe Index by Ingredient, a resource for folks like me eating seasonally, though it's rare I'm wondering what to do with potatoes. My family really hasn't met a way not to like a potato. For more potato recipes I've got a Pinterest board devoted to the potato, follow me on Pinterest to see more. 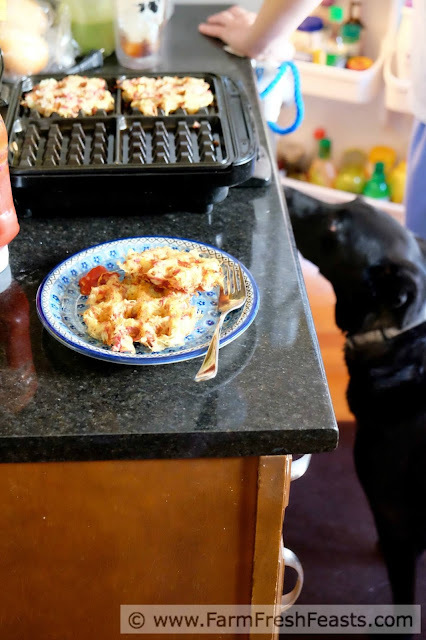 I'm sharing recipes, round ups, and articles that catch my eye on my Facebook page, follow me there. To see more of my utterly unstylish life, follow me on Instagram and know that, even if my dog is the most handsome Basset hound ever, he lives surrounded by plain and simple folk and you're more accessorized than we are. Want to know How to Use this Blog? Note: I baked these waffles at a higher-than-usual temperature (setting 4 out of 5 on my waffle maker) for 6 to 8 minutes. Then I tried them at the usual temperature (setting 3 out of 5 on my waffle maker) for 8 to 10 minutes. I preferred a longer cooking time for a lower cooking temperature and that's what I'm recommending below.This is an Amazon affiliate link to my waffle iron. Squeeze all the water out of the potatoes and onions. I find a dish towel works best for this. Dump the vegetables into a large bowl and stir in egg, salt and pepper until well blended. Stir in corned beef until evenly distributed. Set aside. 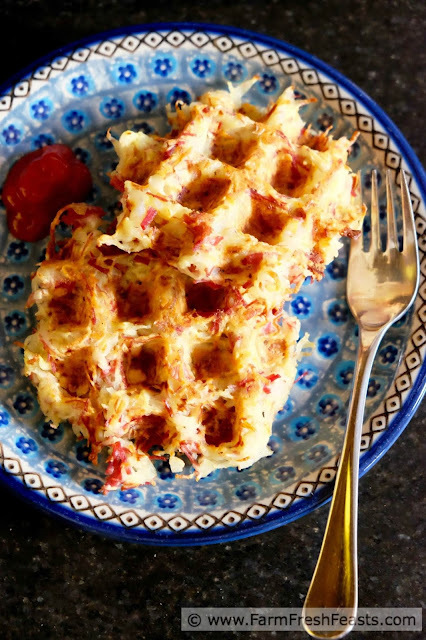 Preheat a waffle iron and spray with oil. 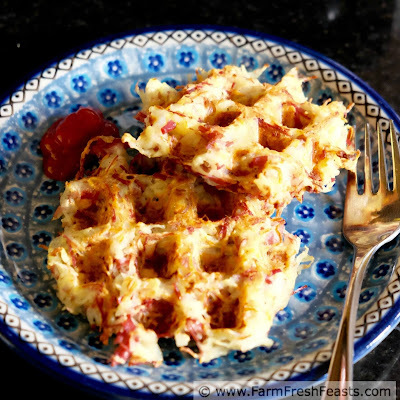 Scoop ½ cup of mixture onto preheated waffle iron. 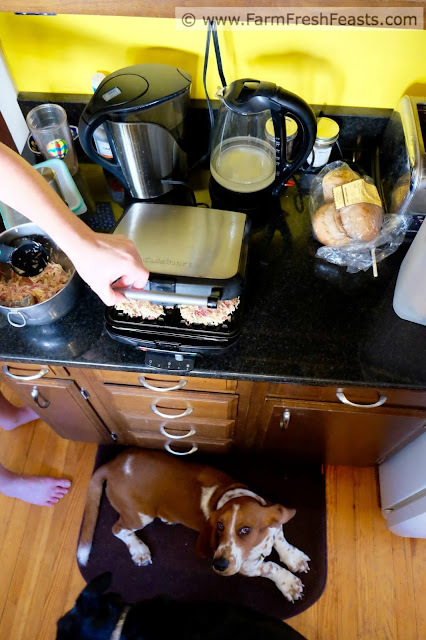 Use the scoop to spread the mixture flat across the waffle iron. Bake for 8 to 10 minutes, until browned and crispy. WHAT!?? 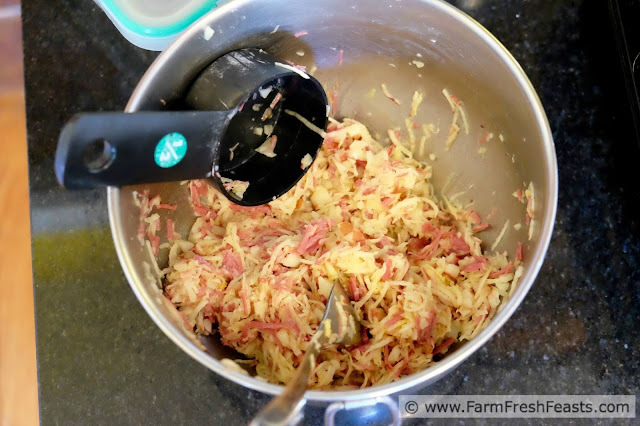 What a great idea for leftovers when we make corned beef + cabbage for St. Patty's Day soon. Definitely ear-marking this post! Ear-mark this, book mark this, just don't try and turn the corner down on your electronic device as I'm not gonna be liable for any damage to your screen. That is a terrific idea. Let me know if you try it!